The biofumigation potential of brassicaceous green manures to Verticillium dahliae was systematically assessed. In a toxicological study, five different isothiocyanates (ITCs) were tested using a bioassay with sterile quartz sand artificially infested with microsclerotia. For 2-propenyl ITC, a LD90 value of 88.7 nmol g−1 was determined. Furthermore, 2-propenyl ITC with a dose of 150 nmol g−1 soil was tested in 22 naturally infested soils. The efficiency varied from 9 % to 92 % and was negatively correlated with the organic carbon content of the soils, indicating that in many soils much higher concentrations will be necessary to achieve sufficient control. To evaluate the biofumigation potential of different Brassicaceae, 19 cultivars of Brassica juncea, Rhaphanus sativus and Sinapis alba were grown in the field. Biomass production was measured and glucosinolate concentrations were analyzed. Simulating the field situation, the biofumigation effect of cultivars was assessed in a standardized laboratory bioassay with microsclerotia-infested sterile quartz sand amended with freeze-dried ground plant tissues. Amendments of B. juncea shoot tissue reduced the number of viable microsclerotia significantly with efficiencies from 69.3 to 81.3 %. Total potentially released amounts of 2-propenyl ITC ranged between 50.6–78.1 nmol g−1sand and indicate a clear ITC-related suppression. However these are considered too low for effective control in practice as low release efficiencies mean that effective levels fall well short of the estimated 150 nmol g−1 of soil required. 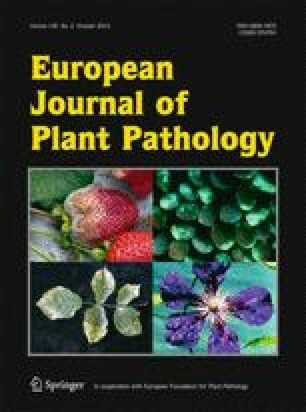 In comparison with B. juncea, the R. sativus and S. alba were less effective due to lower concentrations and/or toxicity of the ITC released. In summary, the biofumigation potential of the cultivars tested appears insufficient alone for effective control, especially on soils with higher (>1.0 %) organic carbon content. This research was funded by the program FhprofUnd - Research at Universities of Applied Sciences and Companies - of the German Federal Ministry of Education and Research.